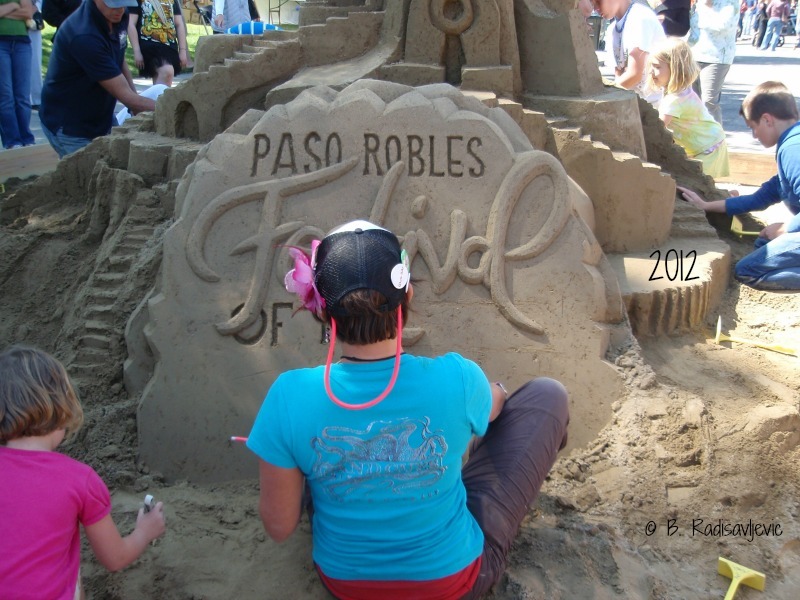 My earliest memories of the Paso Artsfest were during the period when it was called the Paso Robles Festival of the Arts. In 2014, it changed its name to the Paso ArtsFest, and so it remains. 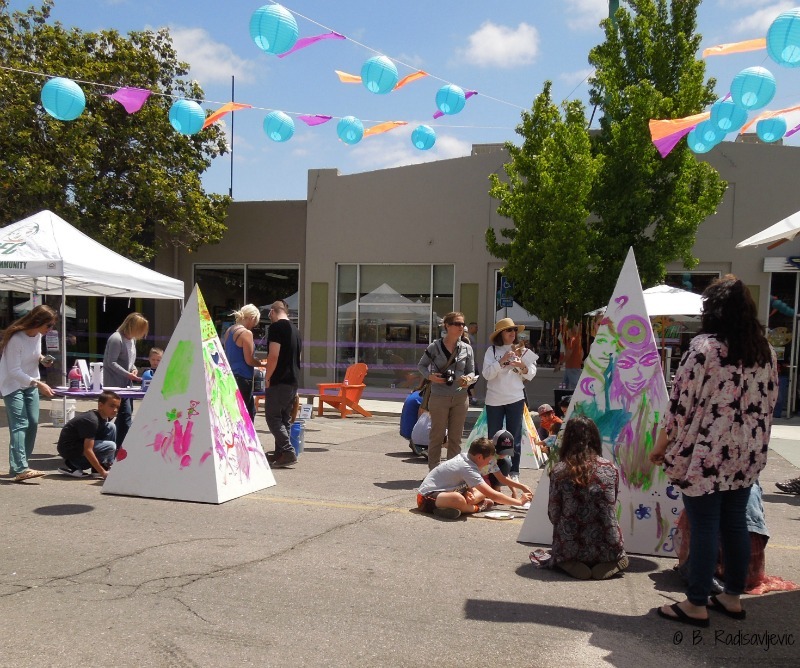 The arts festival changed its name to tie it more closely to Studios on the Park, its parent organization. Although the Main Event is in the Park on Saturday, a good part of it can be found across the streets at Studios on the Park. Outside in the park, there seems to be music and activity everywhere. The music pulsates around you and your eyes are tempted to move in all directions because there is so much to see and do. Across the street at Studios on the Park, the mood is more like that of an art gallery and workplace, which it is. The music is quieter and more soothing. At least it has been very time I've been there. 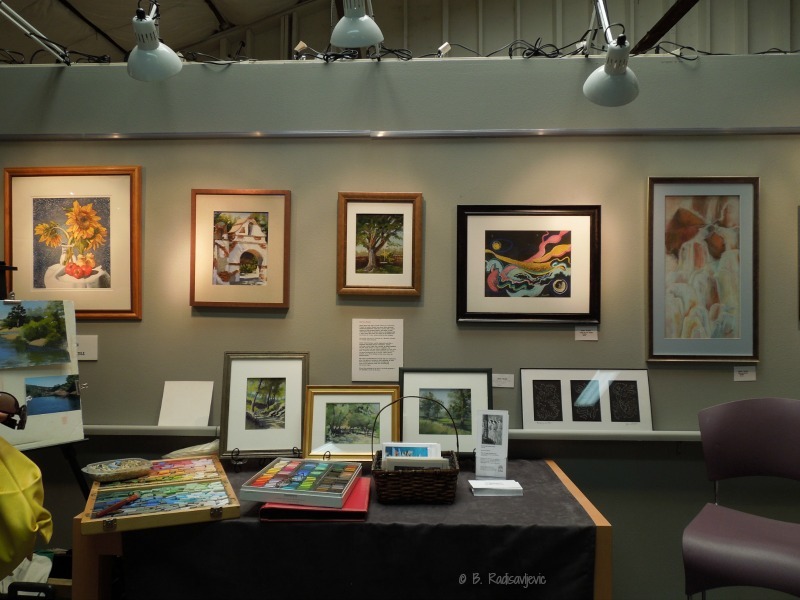 It's a great place to retreat from the bustle of activity in the park and visit with resident artists in their studios. 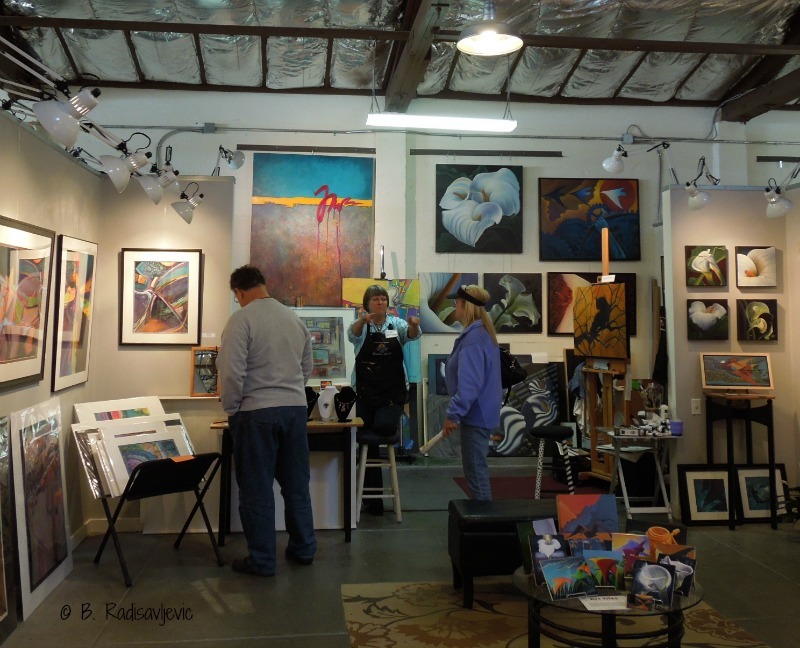 Here are a couple of shots of the 2012 Festival of the Arts within Studios on the Park. There's plenty to see, but it's more peaceful -- not to mention cooler. The photo above is history, since Laure Carlisle is no longer a resident artist. I thought Bill Eckert was also gone, but he's back on the list, so he must have returned. Resident artists always seem to be coming and going, so there are always old friends and some new people to meet. The festival has changed a lot over the years. Some of my favorite exhibit events, like the musical petting zoo, appear to no longer be participating, but at least there will be a Hands-On Percussion activity. You can see the complete Musical Petting Zoo, and other popular 2012 activities in the children's zone about halfway through this video. I suggest you watch it full screen. You can see and and hear an overview of the 2012 Festival of the Arts in this Walk Through the 2012 Festival of the Arts. It includes both photos and videos. One thing I missed last year was the environmental zone. 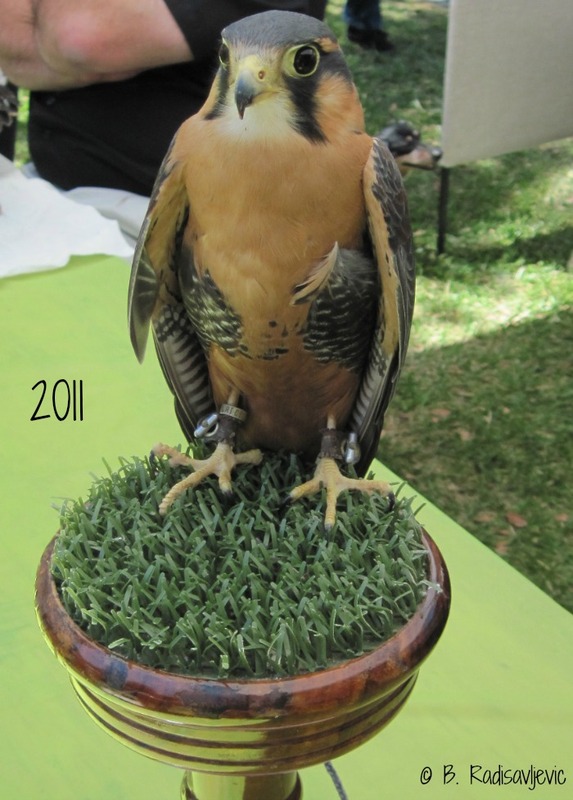 Although I never did see how it was connected to the fine arts, I did enjoy the chance to see the birds of prey and the native plants up close. Photos below are labeled with year taken. Below is one photo from the Native Plants exhibit. 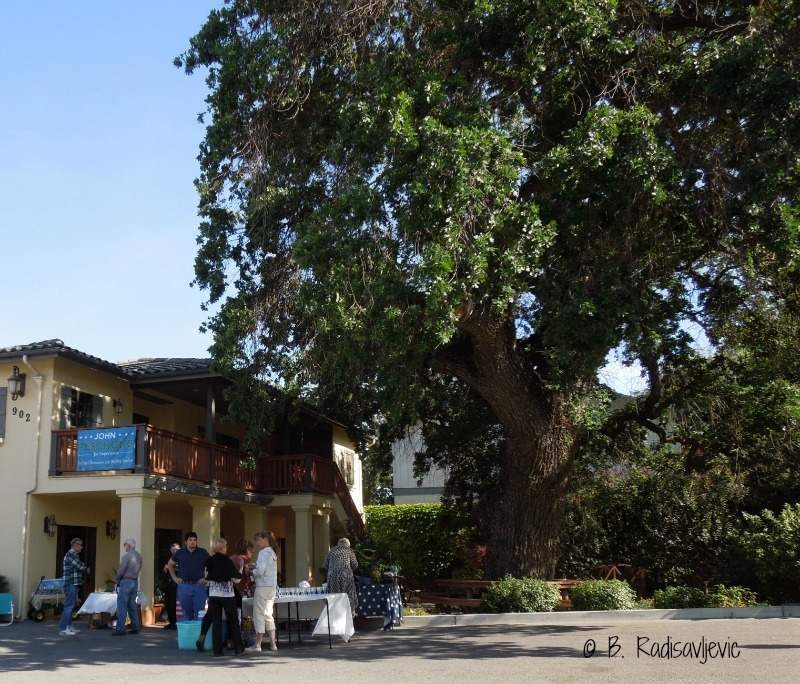 It was here, at the previous year's exhibit, I discovered one of my favorite reference books, A Californian's Guide to The Trees Among Us, after taking a guided tour of the trees in the park with the book's author, Matt Ritter. 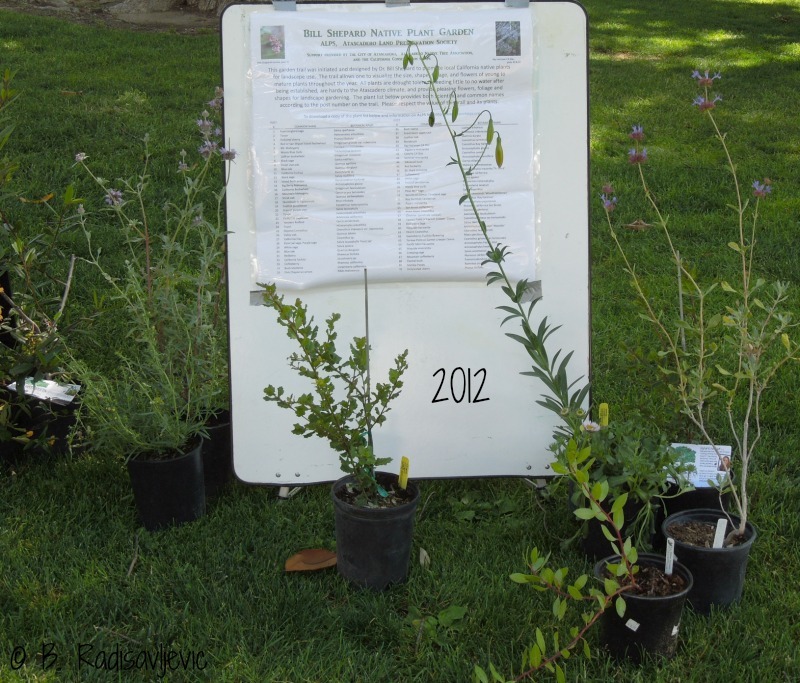 Several books about native plants, including the trees, were on display both years. Below is a kestrel from an exhibit of birds of prey. I believe it was sponsored by Airstrike Bird Control, a service for natural control of birds that attack vineyards. 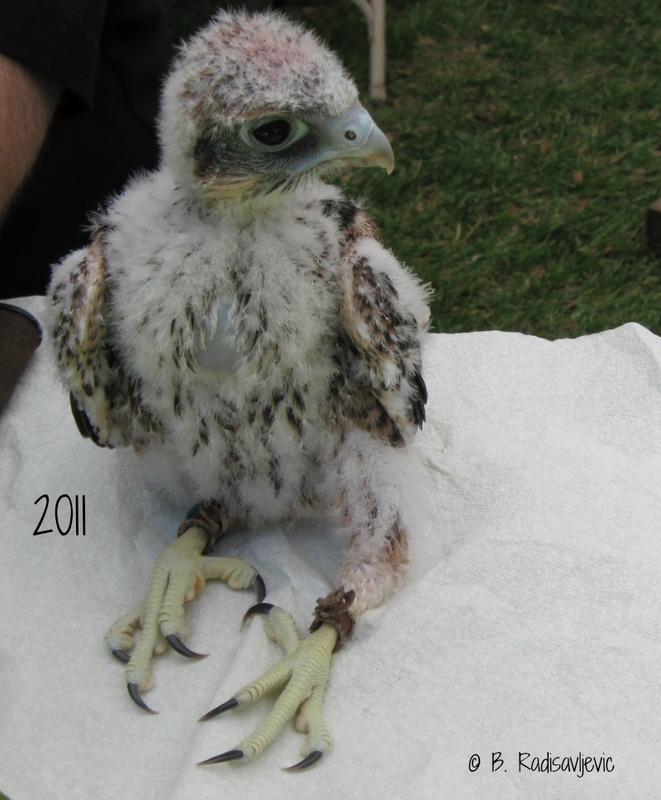 Here's a peregrine falcon chick from the exhibit. It had been rescued. I did find one activity that I had never noticed at previous festivals, but maybe it's because I'd skipped two years. Here's a photo of the Paint Pyramids in 2015. 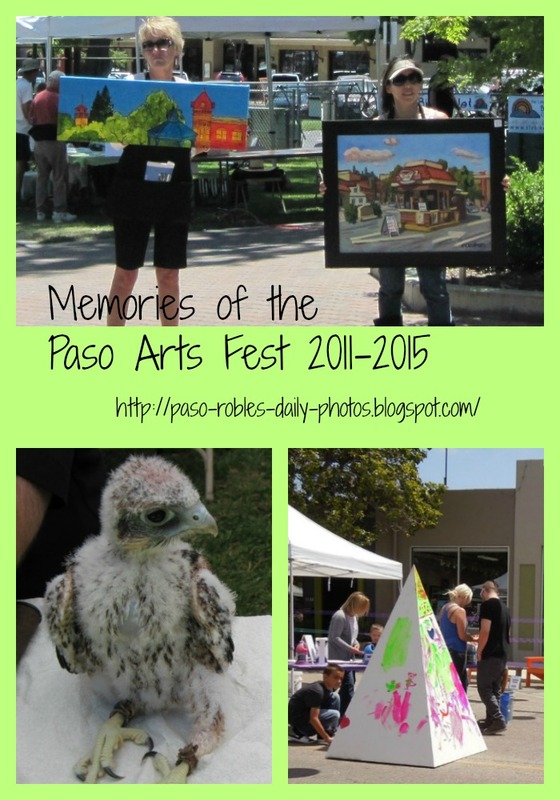 What is your favorite memory at the Paso ArtsFest or any other Festival of the Arts? Is there any exhibit you especially look forward to or miss now? Please share in the comment box below after the sharing buttons. This last photo is just the right size for Pinterest. Note: This post is now historical. The art festivals in the park have been discontinued. Studios on the Park could not keep sponsoring them. 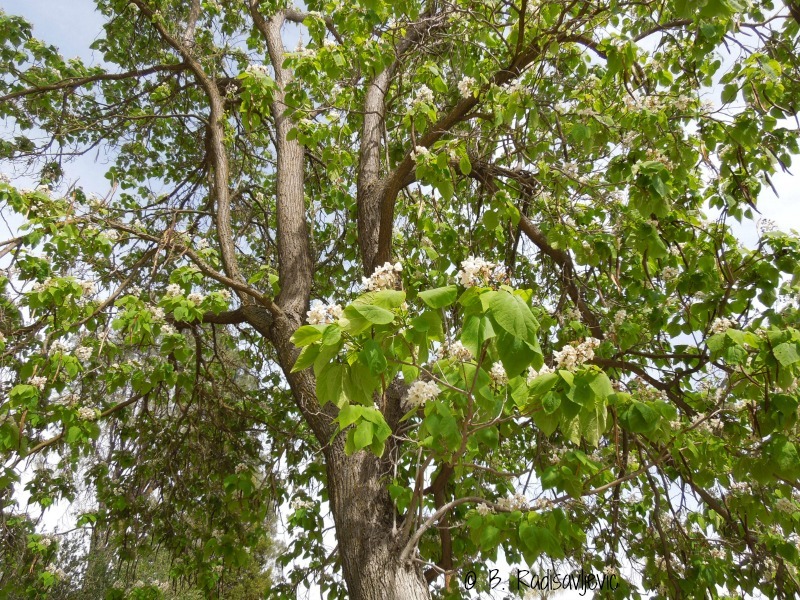 Is This a Catalpa Tree is Blooming in City Park? Now that we've had no rain for a while, beautiful sunsets inland are getting harder to find. 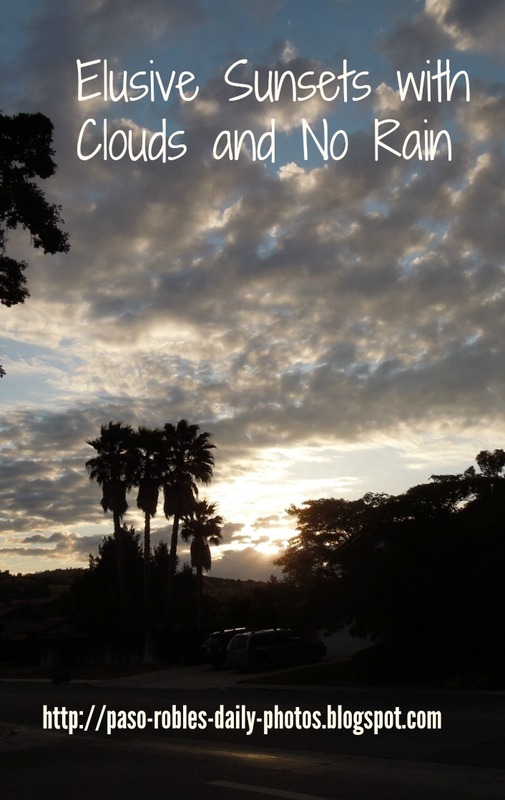 I look at the sky in the late afternoon, see clouds, and get hopeful. By the time the sun starts to set, the clouds have disappeared. So I wait for these elusive sunsets most days, only to be disappointed when there aren't any clouds to make them unique and add color to the sky. Tuesday night I got lucky. The clouds decided to hang around until sundown. My flowers, however, miss the rain. They begin to droop or look tired when they are dependent on the little water I can give them. At least the hollyhocks are blooming, but the carnations are fading fast. I hope the purple hyssop will have more abundant flowers in June, when it is normally at its showiest. The clary sage on the right edge in the middle is producing large buds, so it's on schedule to be in bloom in June. I need to cut back those oregano spikes at the back before they bloom, so I can dry them for cooking. The irises have finished blooming now, but these that get the most water are busy preparing for next year's growth. We need more rain before summer starts. If you also hope for more beautiful sunsets and rain, please post this to Pinterest. If you'd like to comment, please use the comment box that appears under the sharing buttons at the end of this post. If you turn on the radio or watch television or just drive down a city street, you cannot escape electioneering. Now that primary ballots have been mailed, candidates and campaigns are busy everywhere asking for your vote. Politics in in the air and on the airwaves. Never has it been so important to so many people as this year. In other states there have been record turnouts for primary elections. This year California finally gets a say, since some candidates need more votes to clinch their nominations. I hope that will also bring people out to vote in local elections. None of the candidates competing at the top of the tickets would be there had they not started at the local or state level -- with one exception. Even that one exception was involved in the political process, donating to campaigns to try to influence elections and getting to know the people who made political decisions. That, too, is most effective at the local level where one can actually get to speak to candidates and ask questions. 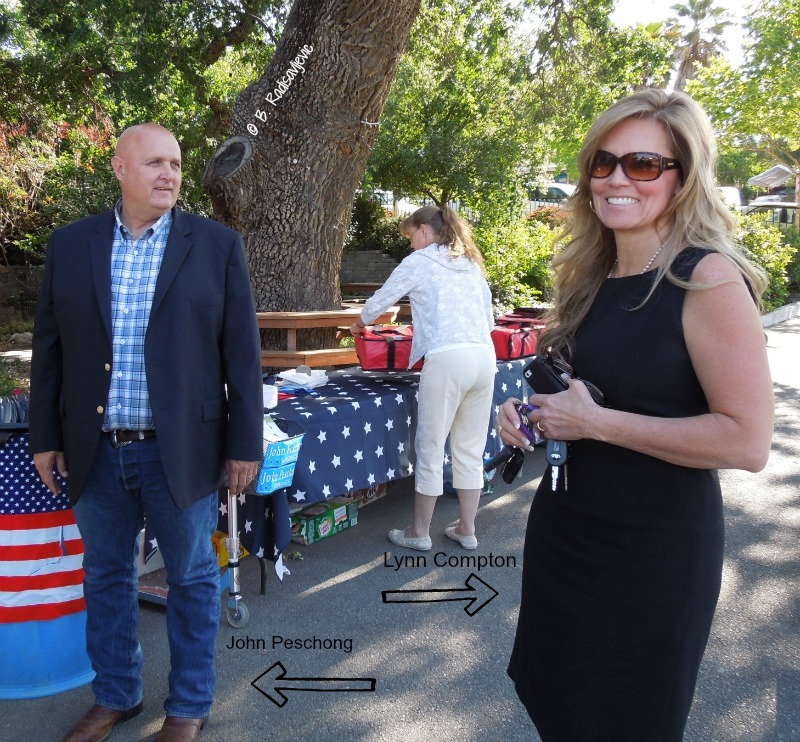 That's why there are many "meet and greets," like the one I attended for John Peschong recently. 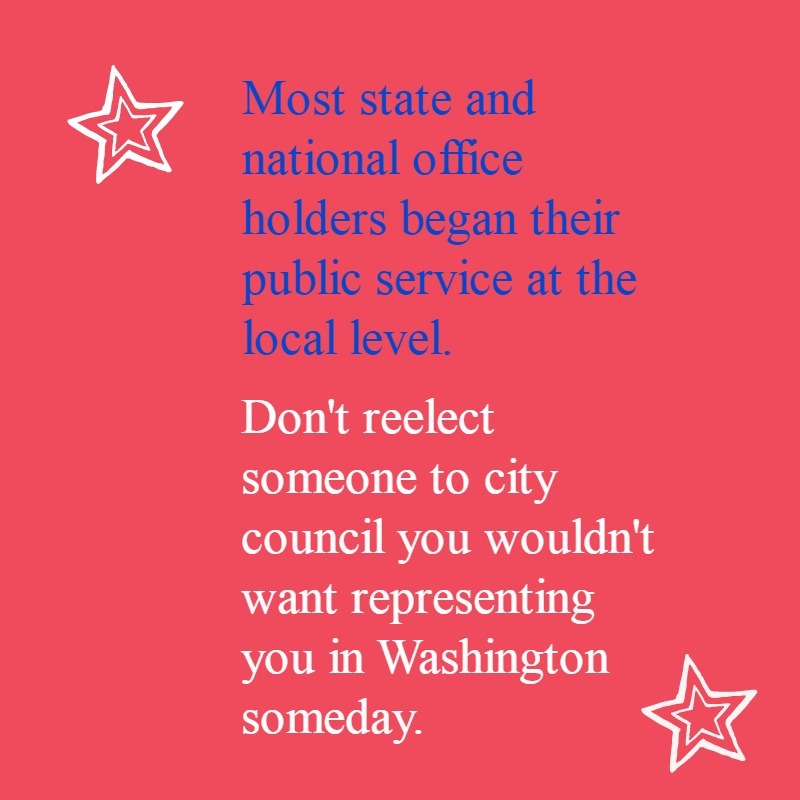 Whom you elect to local offices is just as important as whom you elect to Congress or the Presidency. Make candidates give you a good reason to vote for them. Having the most signs visible around town does not mean a candidate is the most qualified person for the office. Being a nice guy or gal doesn't mean someone is qualified to help run your life, either. Most people running for office seem like nice people. That sometimes means they will try to be all things to all people or go with the flow instead of standing for what is wise and just. Instead of looking just at personality or experience in a bureaucracy (commission, etc. ), look closely at the decisions a planning commissioner, for example, has made and how they may have affected your life. Pay attention. Is this a person you would want spending your money? Is this a person you trust to do what's in your best interests. Will this person respect your property rights? Your water rights? Your First and Second Amendment rights? Look at the record and see if it matches campaign promises. That's not hard to do at the local level. To be an informed voter who will make a positive difference in your community, you should attend at least three meetings of your city council and your county Board of Supervisors when hot topics (burdensome ordinances, water rights, new regulations) are being decided. Watch how your current elected officials behave while in office. Are they insulting other board members or bullying to try to pass unpopular regulations? Does the chair respect those who are speaking for or against a matter on the agenda? Does the chair hush an applauding audience he or she disagrees with or limit speaking time when it's evident those in the audience will not be supporting his or her own positions? If you can't go, watch the meetings on television or listen to them on the radio. (In North San Luis Obispo County you can listen to city council meetings on KPRL, 1230. You can also hear candidates for public office being interviewed or discussions on hot local topics between 12:40 and 2 pm weekdays on the same station.) Body language will often let you know what an official is really thinking. Facial expression will show a condescending attitude toward a speaker. 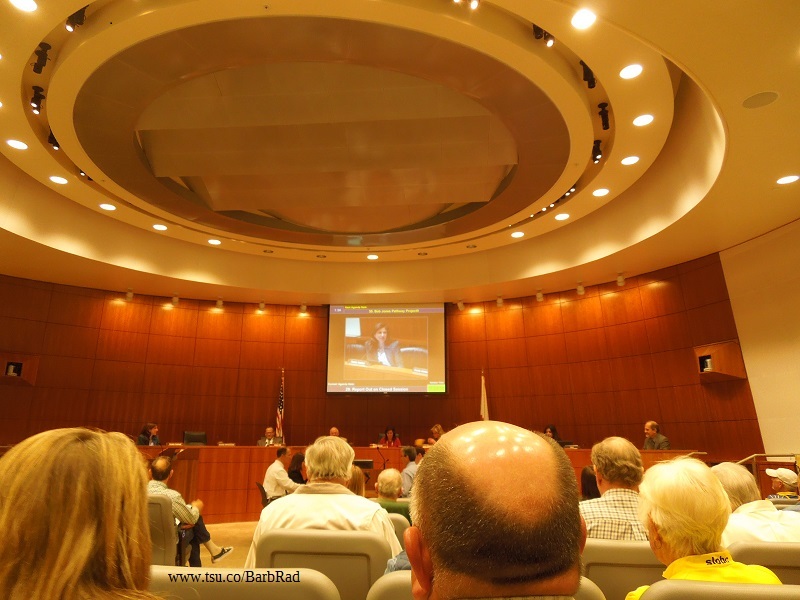 Above you see a meeting of the San Luis Obispo County Board of Supervisors. What happens in this room affects your life in a big way. There are five supervisors -- one for each district. You only get to vote for yours. You can, however, financially support and campaign for the others. Why would you do that? 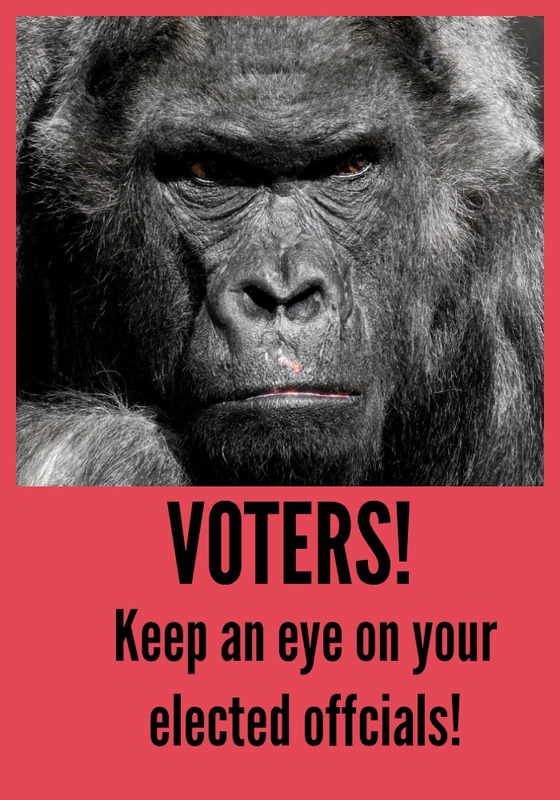 Because they all vote on the decisions that affect your life and they also sit on other boards, like the Air Pollution Control District, Planning and Building, LAFCO, and many more. City Council Members also sit on these boards, as do board members of the Community Service Districts. These various boards decided the plastic bag ban by one vote, and the one that cast that vote knew it was not what his district wanted. It was the Board of Supervisors that listened to the pleas for "regulatory support" from a company that did energy audits and voted to pass a regulation that requires all county homeowners to get an energy audit before they can sell a home. Those audits aren't cheap, and although you don't have to follow all the recommendations before selling, you do have to share the report with a buyer. I was there. Most of those speaking on the issue were against the regulation, but the two supervisors who never saw a regulation they didn't like voted for it, along with an unelected appointee who was filling the chair of a deceased member who would not have voted for it. 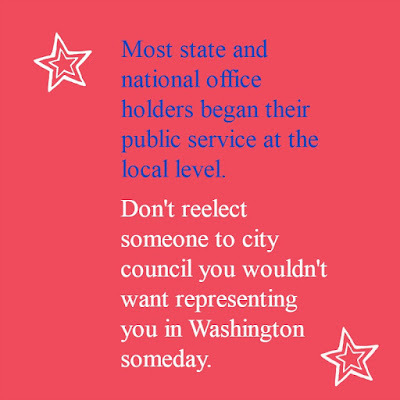 The county supervisors will affect your life -- not just your own supervisor , but the other four, as well. All the candidates for my First District are nice people. I've met them all and I've seen them in action. But I only know of one I believe will spend my tax money wisely and respect my property and water rights. That would be John Peschong. I've watch the others on the Paso Robles City Council and in other settings. That's why John Peschong is getting my vote. Debbie Arnold and Lynn Compton also represent my views on the BOS, even though I can't vote for them. Lynn isn't running this time, but I'm supporting Debbie because she is looking out for the interests of tax payers and property owners and votes against regulations that reek of cronyism. Those on the Board of Supervisors often go on to run for higher office. Katcho Achadjian was on the board and then ran for the 35th Assembly District. 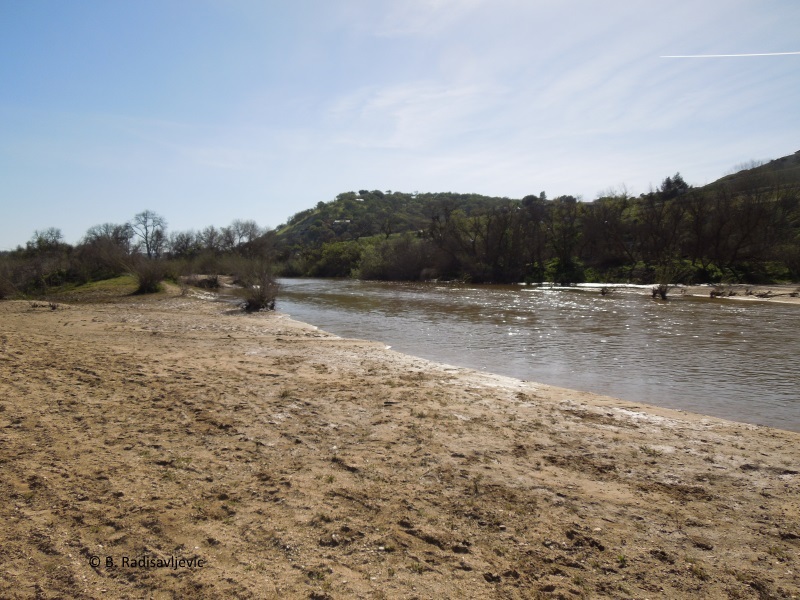 He says in his ads that he won't go along to get along, but he is responsible for authoring a bill to form a water district that would have violated the water rights of rural landowners in the Paso Robles Water Basin. Fortunately, due to the diligent efforts of Cindy Steinbeck in educating people who were affected, the voters defeated the formation of that district -- a district that would have provided no new water sources. Instead, it would have forced rural landowners to meter their wells, which they paid for and have to maintain, to let someone else control the water which they have rights to by law, and to pay an extra fee for someone to manage it. There's no way I will vote to send Katcho, the establishment candidate, to Congress. I believe he will go along to get along. He has in the past. I don't know Justin Fareed. He was an establishment candidate for this seat in 2014 and lost to Lois Capps. Katcho endorsed him then. Some people I respect support him. I still have not made up my mind between him and Matt Kokkonen. If you have a strong preference, convince me in the comments. Lastly, we need to fill the new seat in the 35th Assembly District that Katcho is vacating. I will be voting for Jordan Cunningham. I have known his family for years and I agree with his positions. He is the kind of young man I would like to see move up the political ladder some day if he stays committed to the principles he's running on, once he gets to Sacramento, and if he stands up to those in his own party who will try to control him. When I vote for local officials, I'm thinking far ahead. The local candidates who get my vote are the ones I believe will earn their right to go higher up the political ladder by demonstrating what they stand for at the local level and representing those who voted for them -- not just big donors. I will vote, and then I will watch what happens when they are in office. You should do the same. It's not what happens during campaigns that really counts. It's what happens between campaigns when the winners are in office. Keep an eye on them. Monday Night at Big Bubba's Bad BBQ (try saying that fast a few times) was a filling experience. I'd never been there before, since we usually go to Touch of Paso to eat when we venture out. We were meeting a friend from another state who used to be one of our neighbors in Southern California. We have not met him in person for years, and communication has been by photo and Facebook. He married in January and we'd never met his wife. 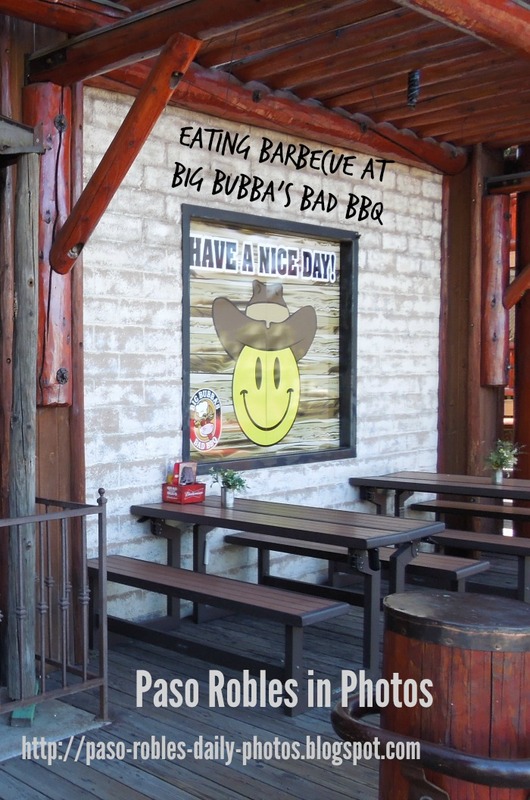 Since he was visiting this area on vacation to see family and show his wife lovely spots like Moonstone Beach, we arranged to have dinner together at Big Bubba's Bad BBQ because it was already after two and because they loved barbecue. We were anxious to meet his bride and we were all hungry. I'd love to show you what we ate, but because of the lively conversation and the joy of actually eating the food, I forgot to photograph it. After taking the photo above, I didn't think again about my camera until we were home. I didn't include people in the photo for privacy reasons. I went back today to get more photos. This one shows the exterior. 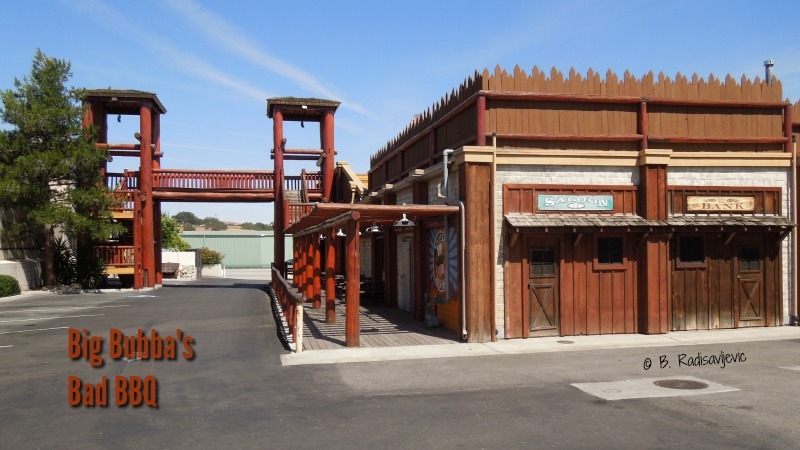 It demonstrates the Western theme. There are stairs that lead to walkways to the lookout towers and the roof. I can imagine one could walk off dinner on those stairs. At the back of the photo you can see the automobile entrance from 24th Street to the Parking area. My readers would probably rather read about the food than our conversation, so I'll discuss that. My husband ordered a half Bubba's Caesar Salad with chicken because he doesn't like to eat a lot in the evening. Portions are large, so half a salad was sufficient. It looked tasty. It came with a delicious looking slice of Texas Toast, which Hubby gave to our friends because he's trying to be gluten-free. They said it was very good. It disappeared fast. Our friends split an order of Beef Ribs that looked like more than four, but that was probably because they were huge. They seemed to enjoy them, along with their sides of corn on the cob and veggies. We actually didn't talk about the food much except to say it was good. Our actions in gobbling it down spoke louder than words, and no one voiced any complaints. I had the Tri Tip Sandwich and told them to hold the mayo and substitute regular jack cheese for the pepper jack cheese. They had no problem with doing that. I only had a taste of the BBQ Sauce that came on the side, but it was a bit strong for my taste. I don't normally eat sauces. They cover up the taste of the meat itself. The sandwich was delicious without sauce. Lettuce and tomato were enough to enhance it. The meat was cooked to perfection. I had been planning to take half home, but somehow I ate the whole thing there. We could have chosen to eat on the patio (above) facing 24th Street, or at any of the tables along the walkway of the building. 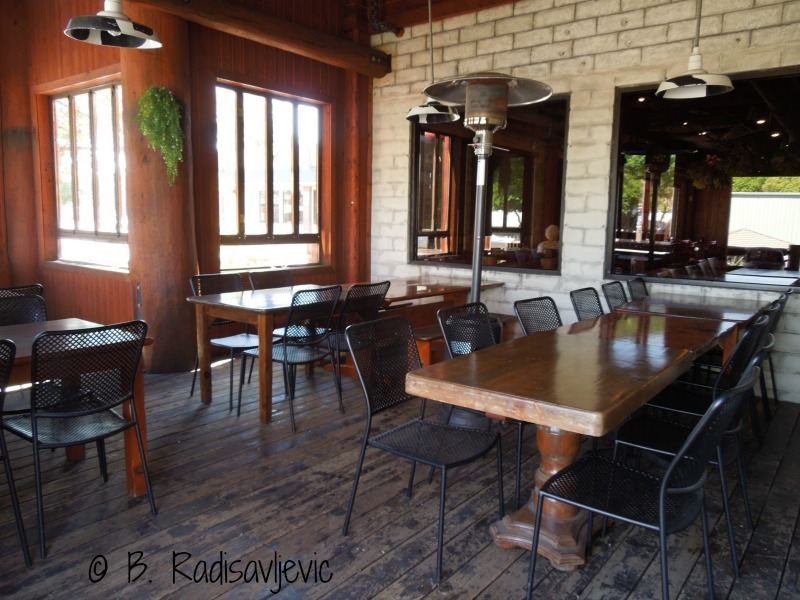 They are more private and, except for street noise, quieter than the tables inside. I still usually prefer to eat inside because I'm sun sensitive. The music inside is not exactly background, but it won't completely drown out conversation, either. I didn't want to make diners inside feel their privacy was being violated, so I took this picture of what I assume is a room for private parties. That was empty today. The chairs and table style are the same in the main dining room, but the main restaurant is darker. If you eat here, you won't leave hungry. I thought my tri tip sandwich was reasonably priced for what I got, and, as I said above, it was delicious. Hubby rated his salad a four on a scale of ten. He said the lettuce was fresh, but the salad's overall taste was just passable. Perhaps he's not used to Caesar dressing, since he usually orders Italian. He said he likes the salad at Touch of Paso (Yelp Reviews), where he always has Italian dressing, better. To see what others thought, as well as photos of the food and interior, check out Yelp. Over all, I enjoyed the experience, but seeing our friends was the best part of it. 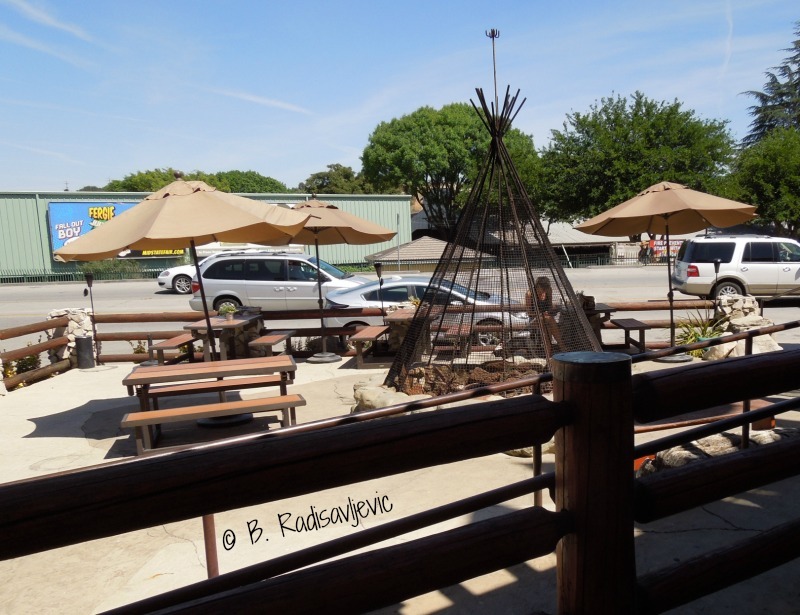 I would not hesitate to eat there again, but I still think Touch of Paso (my review) is a better value if you enjoy American food, don't care if it's barbecued, and can get there before it closes at two. 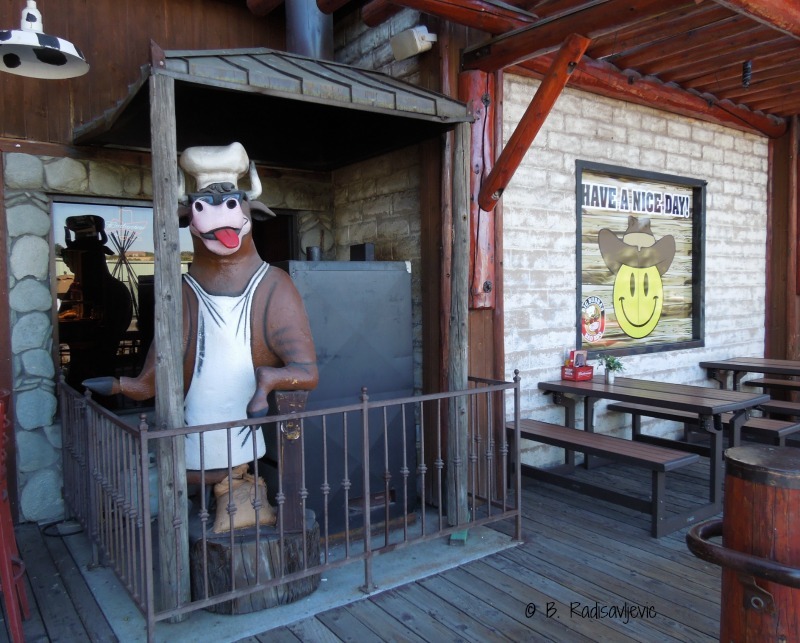 Have you eaten at Big Bubba's Bad BBQ in Paso Robles? If so, what did you think of your experience there? You can comment below. The sharing buttons are just above the comment box if you'd like to share this review. The image below is just the right size to pin. 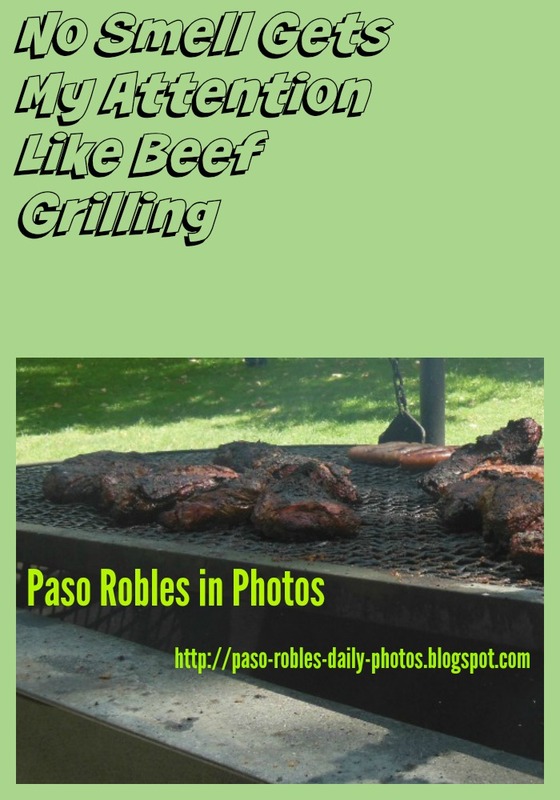 For some time I have realized that daily blogging about Paso Robles photos is more than I can keep up with and do justice to my topics. 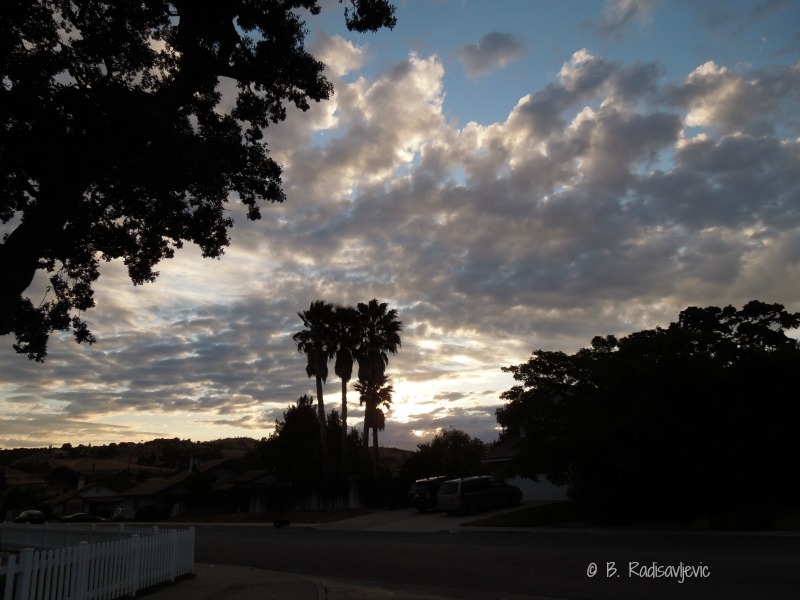 This is one of many blogs, and it has caused me to neglect others, such as Barb's Garden Observations, The Writing Life of Barbara Radisavljevic, Bookworm Buffet, my book review site, and my other local blog, Tidbits from Templeton . I would like to spend more time on these blogs and on my main website for home and school educators, Books to Remember, which is devoted to reviewing children's books and educational resources and teaching materials. Health issues make it impossible to continue all I have been doing. A daily blog is just too much now, when combined with working on other sites. I will still be posting here when I have something specific I want to share, such as an art event, a new photo walk with scenery that's new to me, or whatever else I think might interest you. Right now, though, health issues prevent frequent photo walks, as well as walking very far alone. I hope to still post here at least once a week. All I'm backing away from is the commitment to daily posting. 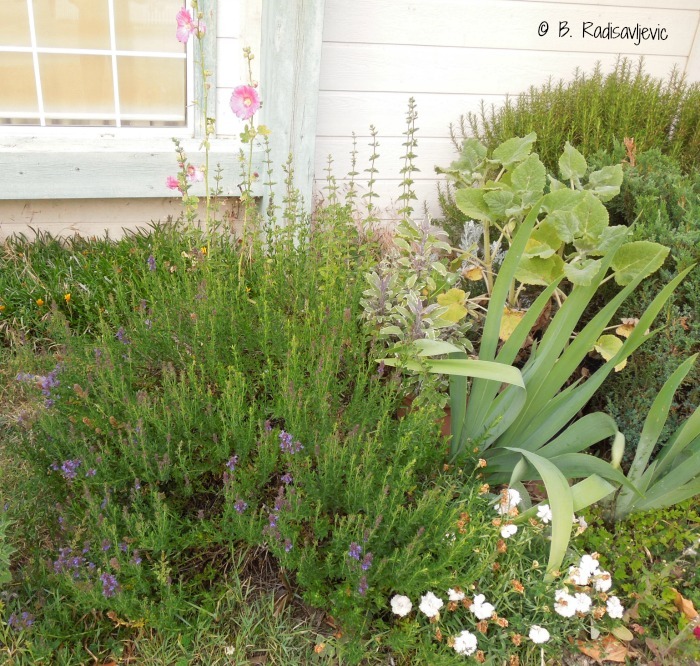 I would like to invite my local readers in North San Luis Obispo County to check out Barb's Garden Observations once in a while to see what's happening in my garden. It's a photographic garden journal where I share not only what's in bloom, but also what I'm learning and the different creepy crawlies I discover in my garden. 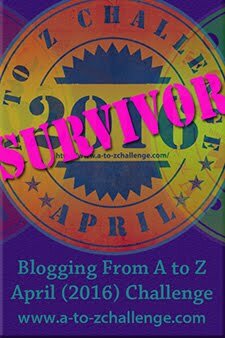 I will miss daily blogging on this site, but I'm recognizing my limitations and doing what makes sense. I want to thank all those who have read my posts regularly, and I hope you will continue to visit, even though posts won't be as frequent. I took that walk at City Park May 3, and the tree got my attention because it was in bloom. 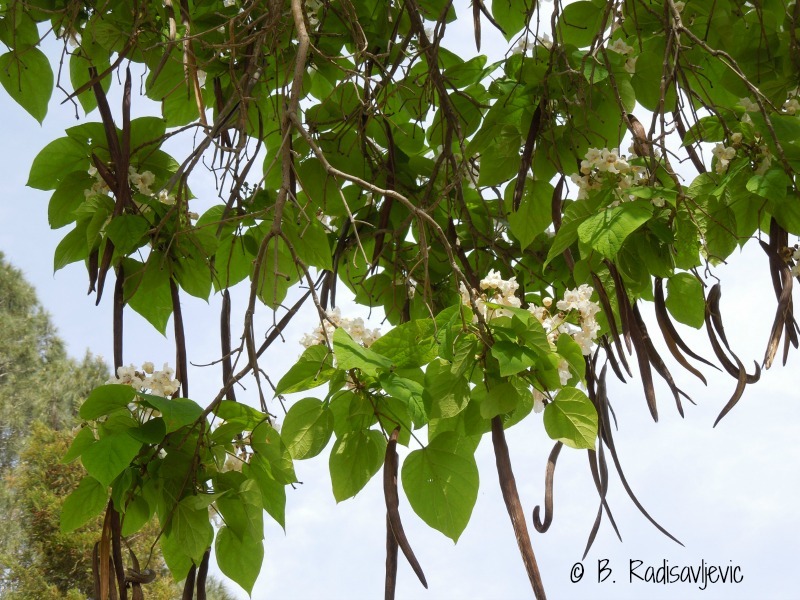 I still don't have a positive identification, but it seems to be a catalpa tree. I was using A Californian's Guide to the Trees Among Us by Matt Ritter, a botany professor at Cal Poly, San Luis Obispo to try to identity it. (This is a great reference book if you are interested in identifying California trees.) I also double checked on the internet to see other photos and they seemed to confirm the identification. Here is the overview. It's also just the right size to pin. Below is just the upper part of the tree so you can see the leaves and flowers more clearly. 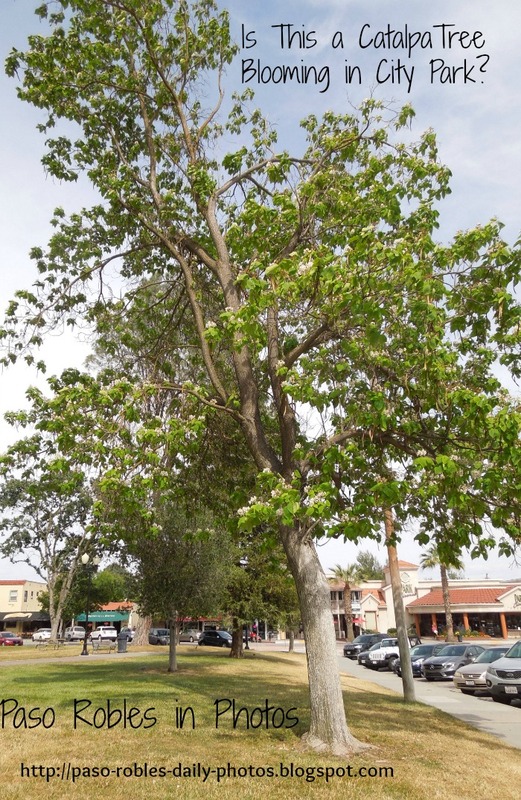 The fruits of the catalpas tree are also present. The photo below shows them clearly along with another close look at the leaf shape. The book says the catalpa tree starts blooming next month, but a lot of my flowers that aren't supposed to be blooming yet are early, so I'm guessing that's the case here. The catalpas are native to the Midwest, so maybe they will wait until June to bloom there. We are in a warmer climate. Mother Nature doesn't always go by the books. The City Daily Photos theme this month is smells. I considered the sweet fragrance that comes from my garden -- jasmine, iris, roses, and the orange tree in bloom where I lived in Newbury Park thirty years ago. The fragrance of flowers is subtle. 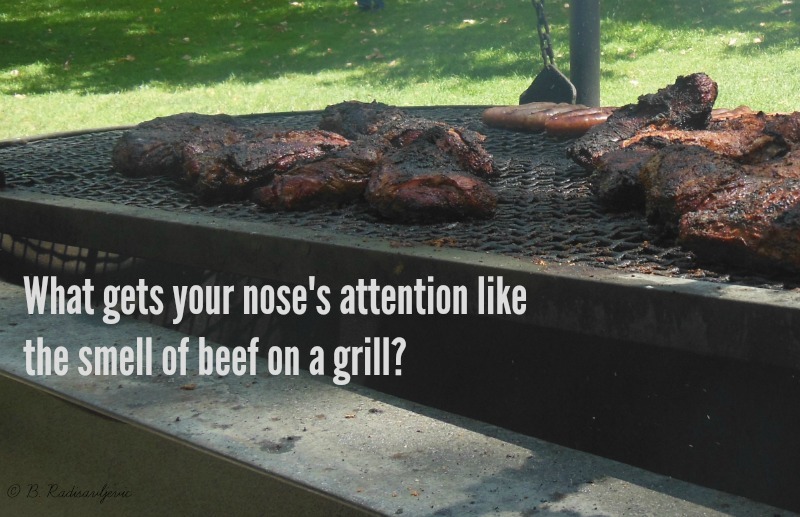 But no smell gets my attention like beef grilling at a barbecue. 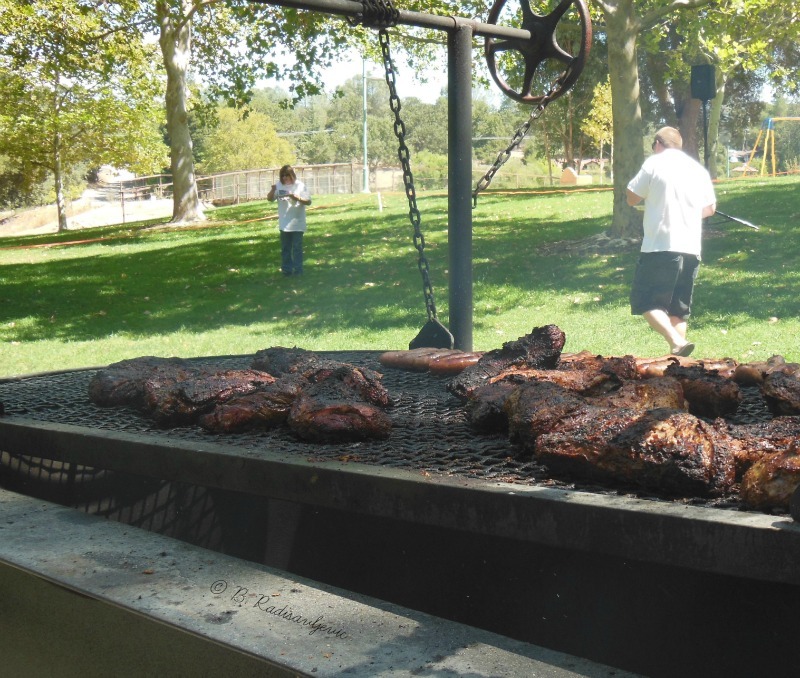 These particular tri tip steaks were being grilled for our culinary pleasure by our public servants -- local elected officials -- at a political fundraising picnic in 2012. Most of the candidates lost, but the tri tip was a winner with me. The bigger picture is below. 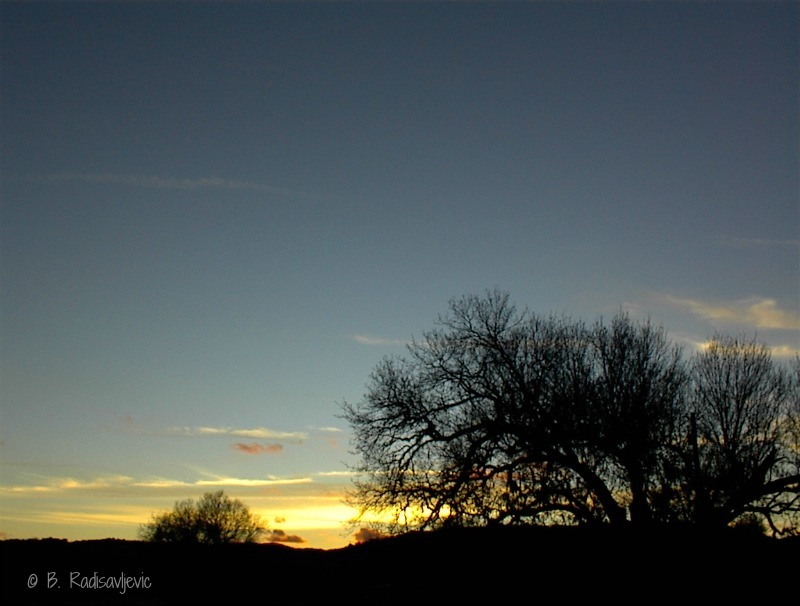 It was taken at Atascadero Lake Park. If I'm working in the garden and my neighbor starts grilling, the aroma of the irises and roses become irrelevant. I get hungry and am overcome by a sudden urge to crash my neighbor's barbecue. I don't know of any pleasant smell that can get my attention in that same way. If you enjoyed this post, please share it. The sharing buttons are just above the comment box at the end of this post. The photo below has been designed for Pinterest.